The footprint design should be outlined drawing 21-0248 [ http://pdfserv.maximintegrated.com/package_dwgs/21-0248.PDF ] after checking the Maxim Integrated's links associated with the DS18B20. There's a tutorial using this temperature sensor with the Electric Imp https://electricimp.com/docs/resources/onewire/. For a schematic, check here => [ https://forums.electricimp.com/t/1-wire-ds1820-hookup-proper-schematic-not-the-connection-board/3782 ]. Actually we want a sensor capable enough to measure the changes of temperature within a room . The query that i want to ask is whether this sensor acts like a thermistor in which we have heat the sensor to measure the change or this sensor DS18B20 can measure the temperature change within room automatically ? I'm using the DS18B20 waterproof type with no problems, if I install an DS18B20 IC sensor in the breadboard running same code it will bring down my Arduino Mega. I'm using connections as per data sheet. I'm only using one and have tried a few doing the same thing to the Arduino Mega, like the IC's are shorted. Any help would be great! The solution given does not tie up the processor with a "Delay(1000)", during which other things can't be done. The approach expects an IO pin to be dedicated for each sensor, but can be extended to allow more than one sensor. Multiple DS18B20s... in combination with other 1-Wire chips, or not.... can all be on one long piece of "bell wire", under the control of a modest Windows PC, with software written (by you) with Lazarus, "the free Delphi". Hi all. Has anyone found a 1-wire sensor like this one that goes up to 150C ? (There are a few SPI or I2C chips around now that now go to 150C like the LM73, but I have not found a 1-wire yet.) The usage needs to read casing temperatures (oil temps) on an sump, diff and a transmission to about 140C... Any leads appreciated. Hi! Is it capable of measuring ambient temp? Say I will mount it above office table and want see how quickly does the temp change when a person is sitting at it. Thanks! Yes... it can. You can READ the sensor a few times in 5 seconds. 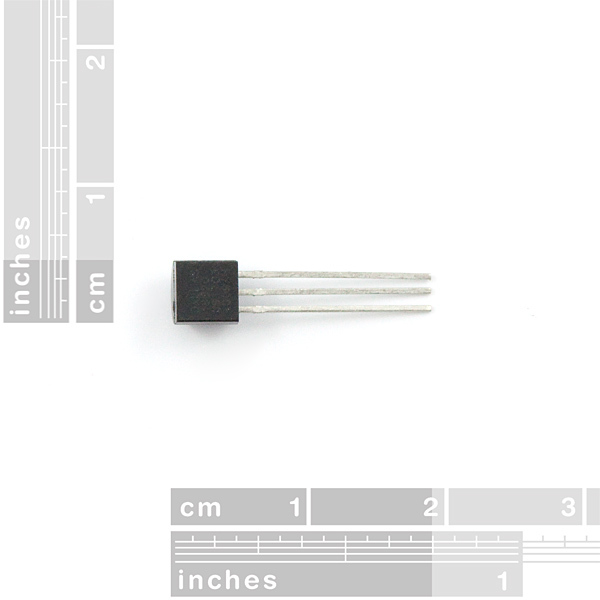 It is "a small blob of plastic" (a bit like an "ordinary" transistor). There's no complex heat transfer mechanism to make it "instantly" reflect a "new" temperature around it. If the tture rose by 5 deg F, I would quess that the sensor would show at least 4 of those degrees within 5 minutes, max. So many variables here! Is the room's air "well stirred". Is the sensor in a "dead zone", near the wall? Did all of the air in the room "jump" by 5 degrees, all at once? Etc. This is super easy to hook up to an arduino. 5v to pin 3, ground pin 1 and hook up a digital line to pin 2. Make sure to put a 4.7k resistor between pin 3 and 2. You can find some sample code here: http://www.arduino.cc/playground/Learning/OneWire. The temperature sensitivity is great. i tried to upload this code and it said that " 'onewire' does not name a type" ??? does anybody have any ideas? To INSTALL: Go down "Sketch/ Include Library/ Manage Libraries" Once that's done, you can use "Sketch/ Include Library", or just put #include <OneWire.h> at the top of the code by hand. Perhaps you forgot to #include the OneWire library? this might be a silly question, plz help me understand. I ran the code as it was given here, http://www.arduino.cc/playground/Learning/OneWire. the output numbers are in the range of 190-193. the setup was @ room temperature. how can i relate this number to degree C or F. thanks. Multiply by 0.0625 to convert to celcius. Really helpful - easily got it working now. Thx :). Accurate and easy-to-use. I posted the design and source of a simple 4-channel monitor/logger using this device, an arduino and EA DOG-M LCD display using the libraries listed here to my website if that's of any help to anyone. Pros: 1: Easy to hook up. 2: Accurate (as far as i can tell). 3: Fast response time. You place your finger on it and immediately the reading starts to rise. Cons: 1: It would be VERY easy to mix this sensor up with a standard NPN transistor since they look almost exactly the same, so make sure you keep it in a separate box. they recommend you use a 4.7k resistor between pin 3 and pin 2, but I have found a 10k works fine, accurate within at least 2 or 3 degrees Fahrenheit of the actual temperature. Perhaps if you need the EXACT temperature you should use a 4.7k, but if you just need a good estimate and you have a 10k lying around, just use that it works fine. I recently used this sensor in a Raspberry Pi project. It's a great device. I wrote a blog post on the build, including the code. I hope this helps you with your project. Anyone know what order the 64 bit ROMs are returned in in a ROM search request of a multidrop configuration? I'm using the code from the Arduino Playground OneWire examples... The function ds.search(addr) returns an array of the found sensors - but in what order? In particular, if I add a new drop to an existing setup, won't the array ordering change? Divide your output by 16 and that should be degrees C. I'm assuming your values are in hexadecimal (we usually write that 0x192) since that would be the correct output for room temperature. 0x192 = 402 decimal / 16 = 25.125 degrees C.
if you get this sensor you need to know how to retrieve the serial unique number from the sensor if you design one wire multiple thermometer. I am looking for an easy way to connect a very large number of these. I recall seeing these small M&M Candy-sized connectors that would only do 2 or 3 connections. There were two sides, and there were small blades that would push through the insulation and make the electrical connection. You used a tool to crimp the two sides together. They were intended for land line connections. There were versions to splice in a drop line, and that would seem to be an ideal solution. But, now I can't seem to find them. I did find the "M&M" sized connectors, but I had mis-remembered what they were. They are the 3M Scotchlok Insulation Displacement Connectors. Most versions of this really only function like a wire nut to tie several wires together, but don't require you to strip the ends. There is one that will do a tap into a line,without having to cut the line, but I would need 3 of these. So, there may not be an easy solution like I was hoping to find. Hi guys! 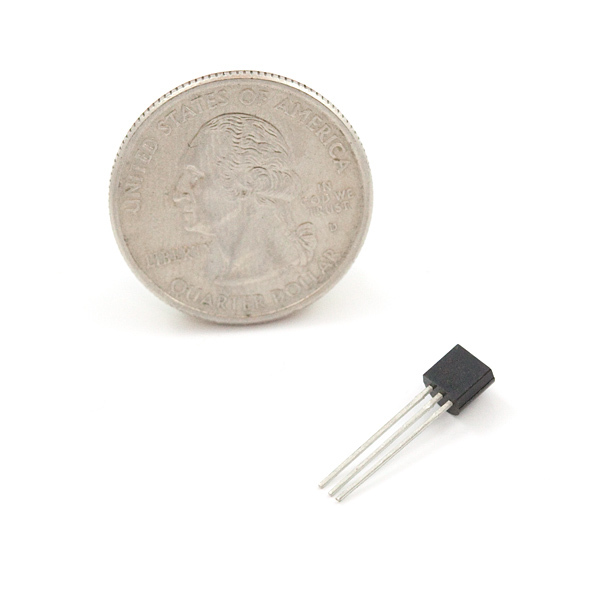 This little sensor is awesome, and I'm looking to integrate it into a PCB I'm designing. Is it in the SparkFun Eagle library? If so, what is it called? Thanks for your help! Okay, so I have a dilemma. I want to sense three different temperatures, so, I need three of these. I have one now for testing that I ordered and got it working with little or no issue. It does appear to work great and is very accurate. I also want to keep a timer or stopwatch (like a kitchen timer) in my application. Here is the issue, these take 750ms to convert the temperature to the data word that I can read out. A "delay(750);" is an eternity in the microcontroller world, especially if I want to do other time sensitive things, such as keeping a stopwatch that ticks every second. So, any ideas? I am worried about when I do need three of these, I know you can put multiples of them on the bus but is it 750ms each??? What about timing issues, how do I know they have each converted their temperature at the same time when reading multiples on the bus? I am considering changing out to a TMP36 or a thermistor. Granted, I would give up some accuracy but I would be able to read them out in microseconds. I have even considered running a parallax propeller because it can run 8 cores. You dont need to do nothing in those 750ms, you can come back later and read the data. For example you can call the function every second and toggle between start convert and read temperature. If you have multiple devices, you can make them all convert at the same time (SKIP ROM command), so you dont need to wait 750ms for each of them. this is great, do you have this product here in the Philippines?. I believe we do ship this there, but our customerservice@sparkfun dot com team will be able to give you an answer for sure. I have two of these sensors connected to an Arduino. One of them is right on the breadboard with the Arduino, the other is on a long wire (about 8 inches). The two sensors have about 2.3 F difference in their readings. If I put both on the breadboard, or both on a long wire away from the breadboard, they are within 0.2 F of each other which is understandable. But why do I get a significantly higher reading from the one that is on the breadboard ? I even tried a TMP102 and a DS18B20. Again one on the breadboard the other on a long wire and I get similar disrepancy in readings; i.e. the one on the breadboard always shows about 2.3 F higher reading. Is there an explanation for this ? Thanks ! Hmm, that is very strange. I haven't heard of this problem previously - it may be something related to signal degradation over the long wire, but you aren't placing them far enough apart for that to be such an accurate and large difference. You might want to check the forums to see if anyone else has run into this problem. Or try switching out your breadboard and see if the issue is with the sensor location or the breadboard itself. "Signal degradation"?? No... that's not going to happen... that's one of the advantages of using a DIGITAL sensor, like the DS18B20. I've tried different breadboards, longer/short wires, changed the location of the sensor, but nothing changed. My last experiment was to put both sensors on breadboards, one on the same breadboard as the arduino (which is a mirco by the way) and the other on a different breadboard. The breadboards are still next to each other as close as possible. But the sensor that is on the same breadboard as the arduino always shows 2.3-2.5 F more... It's driving me up the wall ... next I'll try different power supplies (same ground) and different arduino boards, to see if that makes any difference. I looked and looked on line but I can't find any other resports of this same problem... My guess is that nobody has noticed this. Different power supplies didn't fix it.... and different arduino boards (pro mini instead of micro) didn't fix it either. I'll see if we can duplicate it here and find a possible explanation for you. What a head scratcher! It appears that proximity to the arduino matters afterall... The only explanation I can come up with is that the arduino has enough heat dissipation that it affects the readings of a sensitive sensor like the DS18B20. Anyone know how long the data line can be before it starts running into trouble? Looking to run it using three wires (gnd, +5v, and data), over some moderately long distances (25-35 feet or so). I've used many of these, some on data lines up to 75 feet long with no problems (I use phone RJ11 cables). My favorite technique is pulling apart phone union jacks, putting a DS18B20 inside the jack, and putting it all together again. I've daisy-chained up to 4 this way. i want to know the region (distance ) that ths sensor can read the temp in it ??? I bought one of these to monitor soil temperature in my garden and so far it has held up. I used heatshrink to build a cheaper (read: handy man special) version of DS18B20. It has faired well being submerged in moist-to-wet soil however over the past 14 days there have been 3 small, one-off, events where the temperature reading ended up being -196.6 F.
Readings are taken every 15min. and I have not yet confirmed if it might be a timing calibration issue or if my heat shrinking capabilities are sub-par (I'm going to bet the latter). I'll be buying up to DS18B20 for next growing season but can certainly find a few other uses for this type of sensor; namely indoor gardening. Great product when used within reason. Planning on buying some of these, what type / model number of extension cabling should I use for this? This thermocouple sensor is more appropriate for high temperatures. Thermocouples are analog, so the accuracy and resolution depend on the thermocouple amplifier and ADC you pair it with. I'm running a couple of these from a Raspberry Pi. One of them is right on a breadboard, the other is on a 15ft wire lead. When I place the two sensors next to each other indoors they read within 0.1 degree Fahrenheit, Awesome! When I run the wire lead outside the accuracy goes down substantially as much as 30 degrees. The outdoor accuracy is almost perfect at night but when the sun comes out I get the wide range of error. Are these things light sensitive? Where is the noise coming from? Note that I'm using a LaCrosse thermometer, which work great, as my reference. Is the outdoor sensor in sunlight? If so it will get warmer than the surrounding air. Put the sensor in the shade. Weather stations use a vented, white enclosure to keep sunlight off the temperature sensor. Do you need an MBed Application Board to try the mbed example above or could it be done on an Arduino UNO R3 by changing pin 25 to lets say pin 2? This should work on 3.3V right? Correct. The power supply range is 3.0 to 5.5v. I want to operate this sensor from audio plug via PC with audio input/output. Is there some way to do this? do I need more other product to do this? Anyone able to speak to waterproofing these with epoxy? I'm hoping to build my own inline water temp sensors similar to: http://martinsliquidlab.org/2012/01/05/radiator-test-bench-v2-design-build-log/ about half way down the page (search for inlet sensors). I tried contacting the author, but still have yet to hear back. I need several of them, and epoxy into a tubing coupler may work better than any pre-packaged setups out there. Does anyone have experiences with DS18B20 and long wires? I want to hookup mine on a 80 feet (25 metres) wire. Ok, i just tested it with 30m twisted ethernet cable (not shielded), and it worked! Has anyone used this sensor with the LIFA toolkit? I''ve been having some problems on my Mega 2560. Just a note for anyone who decides to use the code from the Bildr Tutorial.. Some guy told the author that he had a bug in his code, and so he changed a value near the end from 16 to 2, but now it does have a bug. I changed my code back to 16, and the code is now working properly. I switched back to the original code. Anyone has a sample code of this sensor for verilog? I just purchased a few of these recently. I was wondering if anyone knows whether it's possible, and how difficult, it would be to interface these sensors with a NI USB-6008 DAQ and LabView. Great, great sensor. Very clean output. Very sensitive. If you hold it in your hand it will spike very quickly. Great sensor. Do you have an eagle file for it? I know I could modify a transistor layout but it would be nice to have an accurate one for it. I am also having problems getting this to work with a Picaxe-08M. Are these the old style sensors? The Picaxe manual states "Note the readtemp command does not work with the older DS1820 as they have a different internal resolutiom." If these are the old style that should be listed in the product description. Mine does not work and i am using mine with a PICAxe. Help me someone, KATE!!!! Check the wiring diagram. The datasheet for the PICAXE 08M should show the diagram. There is a command already written for it, by the way. Try "readtemp (pin),(variable)". It currently supports the DS18B20, DS18S20 and DS1822. Thx. for the link ScottS. Excellent sensor that's a huge package in a small box. The best temperature sensor to have in your toolkit. With so much on board capability you will save memory and processing time. Fun little devices -- accurate and cheap. They're also insanely easy to wire up. When Maxim says "one wire," they mean it; you can even power it using the data line if you're careful about timings and provide a strong pull-up when needed. Developing code to drive them is nontrivial, though (various layers include bit timings, commands and ROM codes etc), but once it's working, they're very reliable. And remember that the 1-Wire family includes many devices. You aren't limited to temperature sensors. There are digital input and output modules. Analogue input modules, etc.